The first-person dungeon crawler is something I’ve admired for ages, albeit from a distance. As a kid of the 80s and 90s, I grew up playing my fair share of these types of games, such as Dungeons and Dragons: Warriors of the Eternal Sun and Shining in the Darkness, but outside of last year’s The Lost Child from NIS America, my experience with the genre in the modern era has only consisted of curiosity and intrigue, not really first-hand knowledge. But when I heard that Fatbot Games’ Steampunk Crawler was to be released on Switch soon, I figured the opportunity would be prime for some more skill sharpening on my part. And boy, was I right about that. Vaporum tells of a story that we likely all know too well, but it is the actual presentation that separates its wheat from the chaff. 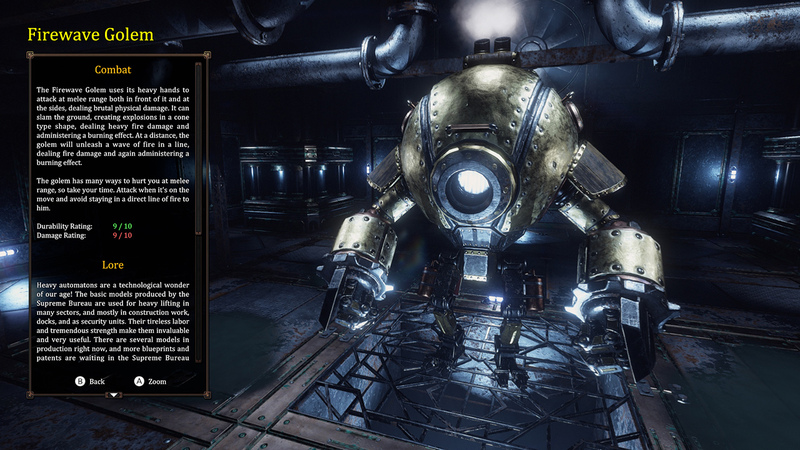 While perhaps aesthetically being inspired by Bioshock and other previous steampunk titles, the thematic similarities are really only skin deep. The protagonist of the story wakes up in the middle of the sea, with no recollection of who he is, or why he came to rest at such an odd location. In the distance, he sees a gigantic tower that he – although cannot recall why – is compelled to go towards. With little but a gut feeling, he makes his way into the looming tower, with no real idea what is in store for himself within its halls. Inside, further context is obtained through first-hand experience, notes, and audio logs scattered about the multi-floored monstrosity. One thing is for certain from the get-go – something went very wrong here. Horribly disfigured creatures, haywire machinery, and bloodthirsty humanoids in souped-up diving gear run rampant through the dark halls of the tower, and it is clear that you must also adapt to survive. The hero helps himself to one of a handful of combat-ready exo-rigs (details on that later), arming himself with guns, crowbars – really, whatever he can find – before advancing into the darkness within…hopefully for answers. While Vaporum is certainly a story-driven affair, it is doled out via exploration rather than being cutscene intensive. The aforementioned audio logs and scribbled notes are the primary delivery devices of the narrative while the hero will also share his own thoughts audibly from time to time. This kind of delivery method is something that is definitely hit or miss with some people, and I can easily say that this would not be the ideal game for those that despise the whole tape recorder and note approach to storytelling. That said, I found the logs and sporadic thought dumps from the hero quite interesting rather than the more traditional approach. It helps that both the dialogue and voice acting are well done, especially for a lower priced indie outing. Vaporum is one of the better looking Switch games I’ve played thus far, though it obviously has seen a downgrade from its PC counterpart. Textures are detailed nicely, and really help things pop when your flashlight (or headlamp) shines on them. Advancing to new levels often means that the floor and wall skins also change, which is nice indeed. Asset-wise though, Vaporum is a little bland and rather stingy on placement. While you do have access to a mini-map any time, it is often difficult to determine where you are by your senses alone due to that prop scarcity. You’ll see tons of desks, bookshelves, boxes, and shipping containers throughout the tower, but they don’t feel strategically placed and ending up looking samey more than anything. Ultimately, I would have loved for the team to use more varied assets, more liberally, but the base skin of the floors and walls do a good enough job of keeping you immersed in this world (or tower) they’ve created. 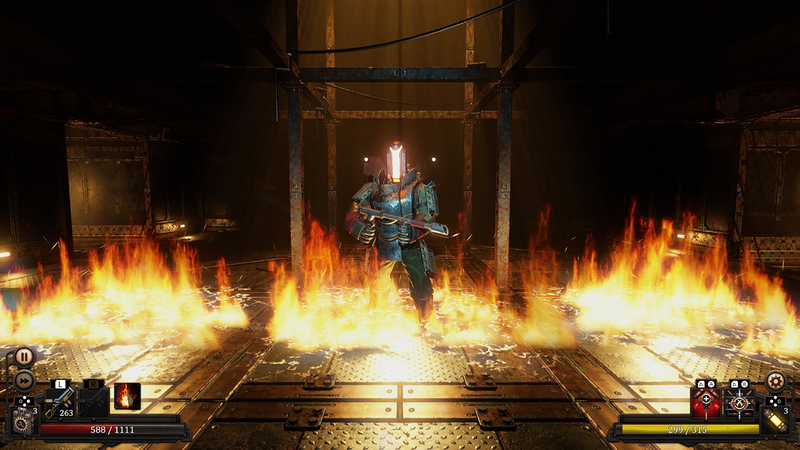 Vaporum touts itself as a real-time combat, grid-based dungeon crawler, and that is completely accurate. Movement is done in classic dungeon crawling fashion – moving one space at a time – and you are also able to turn in place or strafe as it suits the situation. 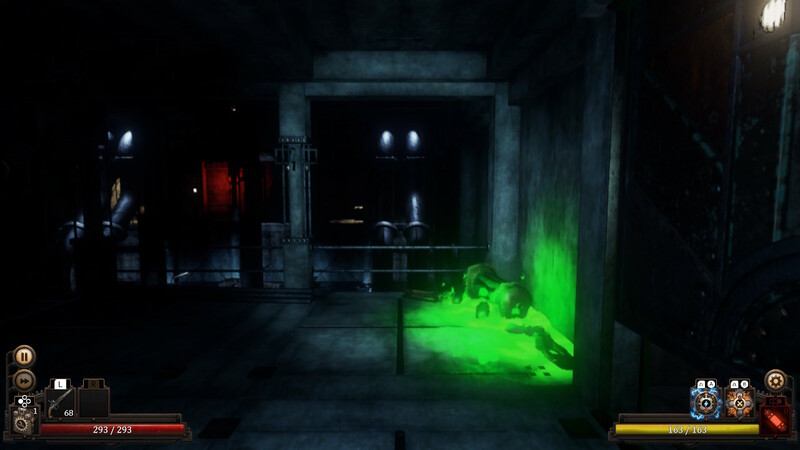 You can also look around whilst standing still – often a valuable tool when trying to get to the bottom of some of the game’s more obtuse puzzles and challenges. Speaking of puzzles, there are LOTS of them here and many of them can be quite difficult to solve without paying very close attention to your surroundings. Also, remember that little trick you did a single time a few hours ago? Better not forget about it, as it may pop up again in a slightly different form. The real-time system would have you think that it is encouraged to blaze through levels, but in reality it is actually the opposite. Puzzles will slow you down tremendously, and again, if you aren’t paying attention to every little detail in the background, you could easily get stuck in multiple places. Of course, this is all coming from someone that is definitely not the best at dungeon crawling games, so these situations may feel right at home to those more in-tune with the ebb and flow of exploration and puzzle solving. Combat is real-time, and can become very intense and rather tricky when faced with multiple opponents and/or in cramped spaces. Towards the beginning of the game, after you don your exo-rig, you will discover that you can opt to slow down time to a more turn-based crawl rather than the more in-your-face real-time system, and I must say that this tool was invaluable in many situations. Obviously, it helps tremendously when you are able to stop and think about the best course of action when facing more difficult or multiple enemies at once, but it also comes in handy for some of the more time sensitive puzzles and traps. While you can turn this time stopping feature on and off at any time, Vaporum kind of presents it in a way as if it discourages its use. It is kind of like, “hey, here’s this thing you can use if things get too difficult for you” while at the same time implying that perhaps you shouldn’t abuse it. That could all just be in my head though – who knows. As far as I can tell, there are no penalties to keeping it on forever, and I am not ashamed to say that I used it a lot. I’m not an elite RPG player by any means, but I pride myself on being able to comfortably take on higher level difficulties in many action and turn-based RPGs. But with Vaporum, there was a sense of fear almost non-stop, even on normal mode. Surely, this stems primarily from my lack of experience in the genre, but also could be because of other things. While I never felt like the game was necessarily unfair, I will have to admit that there are far too many “whiffs” with attacks, and pretty much all but the most basic of enemies are damage sponges. Your exo-rig’s circuit system – aka the talent tree – will offset this some, but never enough to really make a huge difference in my opinion. Perhaps I just spread myself too thin as far as circuit point allocation went, but I really only invested in maybe 3 out of about 8 categories at most. Enemy attack patterns vary, and they can really dish out the damage if you aren’t careful. With most of them, you are able to get a dance down of attacking and evading, which usually works out well in one-on-one scenarios. However, there are so many tightly packed areas and corridors where you have to face off against more than one enemy at a time, that you’ll often get frustrated due to the lack of options available to you. And unless you build out your character on the more tanky side, you’re going to want to evade as many attacks as possible otherwise you’ll burn through your repair kit stash and, eventually, die. I should stress that this could be a case of needing to “git gud”, and I’m not above admitting that. In fact, I did eventually end up dropping the difficulty down a notch – in between casual and normal – and found it to be a lot less stressful, but the damage sponge and missed attack situation persisted (although were much more bearable). Outside of that, I do think that Vaporum’s challenge is dished out in a relatively just manner, and I feel that medals of honor are due to those crazy people that can beat it on the higher difficulties. So, back to the exo-rig. Remember how you can select one at the beginning of the game? There are actually a few to choose from, with each giving certain bonuses catered towards a specific aspect of combat. For example, the combat rig can give you a 50% bonus to damage on every third attack, among other perks. There is also a more tanky rig and a tech rig, which improves your defensive capabilities and bolsters the capabilities of your gadgets, respectively. Gadgets are one of many items that you can attach to your exo-rig, and essentially act as spells in the realm of Vaporum. While most are offensive in nature – like electrical shocks, acid, and flamethrowers – others increase your resistances to damage-over-time or boost your damage reduction temporarily. You can equip up to four of these at a time, depending on your circuit point choices, though some builds will only have access to two at once. Gadgets aren’t “set and forget” either because certain enemies will be completely immune to specific schools of them. In other words, don’t use poison/acid gadgets on poison/acid enemies, and so on. Your actual weapons are more proficient against certain creatures as well. Blunt weapons tend to work best on mechanical enemies while slash/piercing generally deal more damage to organic beings. There are tons of weapons, armor, and gadgets out there for you to collect, with some of them being more powerful “named” pieces complete with special effects and modifiers. 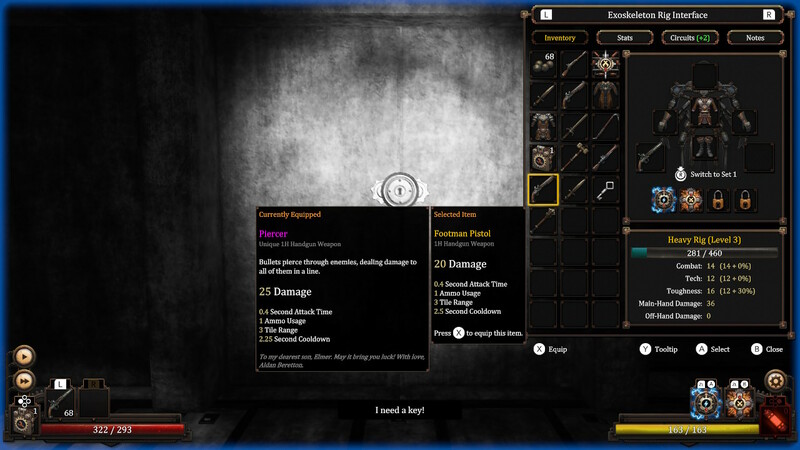 Because of that, inventory management and awareness of enemy weaknesses are key to smooth and efficient combat. Didn’t you say this was real-time though? Yeah, so that is another thing that I don’t really like here. The emphasis on inventory management and swapping out gear doesn’t really work the best with more action-oriented play, especially when keybinds aren’t a thing. 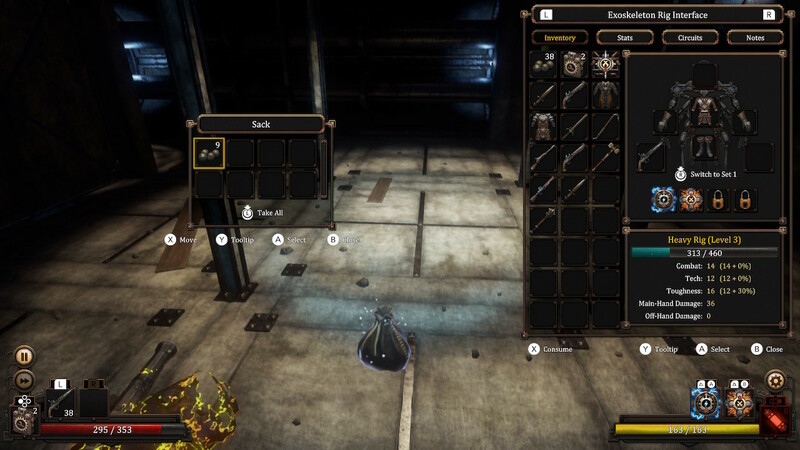 Sure, you can swap between two sets of weapons on the fly, but gadgets cannot and since some of them are completely useless against certain enemies, you will definitely be swapping them out frequently. This will likely affect those with two gadget slots more than those with four, however. Of course, you can always just stop time upon facing a new challenge, swap out your stuff, and carry on but it feels like that goes completely against the real-time nature when you do it on a consistent basis. Vaporum is a good game, one that I believe will resonate deeply with fans of the dungeon crawler. The dark industrial setting is a pleasure to take in and experience, though the actual asset work and placement leaves a lot to be desired. Despite enemies feeling like damage sponges, the gameplay loop is solid, providing lots of depth and much to think about in regards to exploration, puzzle-solving, gear setup, and circuit point allocation. Would I recommend it to the more casual dungeon crawling enthusiast? Maybe, but maybe not. 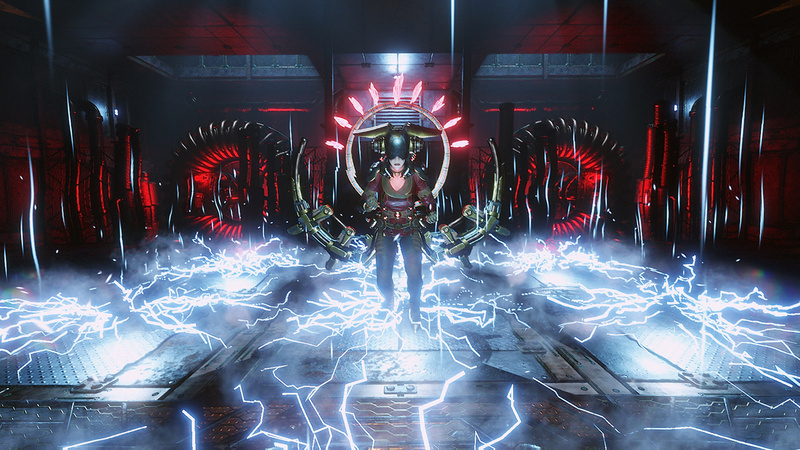 There are five levels of difficulty which should cater to all playstyles, but that won’t change the challenge and complexity associated with many of the puzzles. Vaporum is very much a thinking game, despite being labeled as a real-time dungeon crawler. If you actually want to use your mind a bit – or have no shame in using a guide at times – Vaporum has much to offer.